I used my Cricut and the Ribbons and Rosettes cartridge to cut the butterfly. The bakers twine is called Buttercream and is from The Twinery. The crinkle ribbon is from My Craft Spot. I hope you can hop on over to the My Creative Time blog and see what the other designers have come up with from this challenge and also to participate with us!! 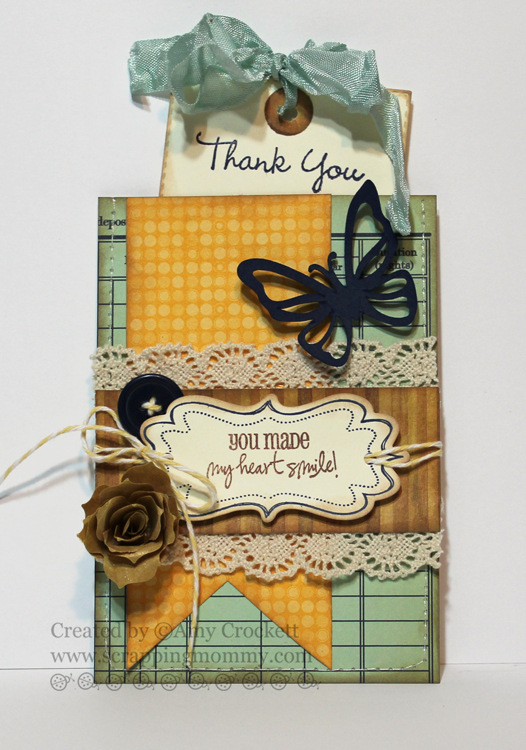 Very pretty pocket card, love how you changed it up to make it a thank you card!! Wow! This is absolutely beautiful, Amy! I love the colors and patterns you used! Amy ~ This is just ELEGANT looking! LOVED your photo inpiration and TOTALLY LOVE yours! What a BEAUTIFUL paper and embellies! As always so tastefully done! this is adorable! I love all the colors that you used together! great job! I love this card and yes I love pinterest, I am addicted to it. Thanks for sharing this card. Beautiful take on your pinterest found project. I am slightly *cough* addicted to pinning, but I always find inspiration! Thank you for sharing. Oh SO Beautiful! I love the pocket idea! Amy this is so cute! What a fun challenge Emma created:)I am new follower of yours:) This is the 1st time I search Pinterest(dont know excatly how it works)but there are so many great ideas:) I would love an invitation to Printerest! 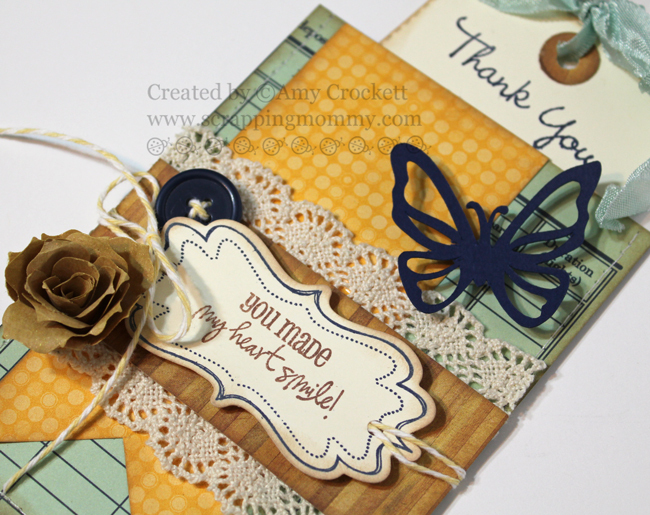 Beautiful job on your pocket tag card...your embellishments are perfect. I have tried to stay away from Pinterest knowing I will spend way too much time there and can hardly keep up with blog hops and the blogs I try to follow. Emma made me do it :D Would you please send me an invite to Pinterest?? Thank You!